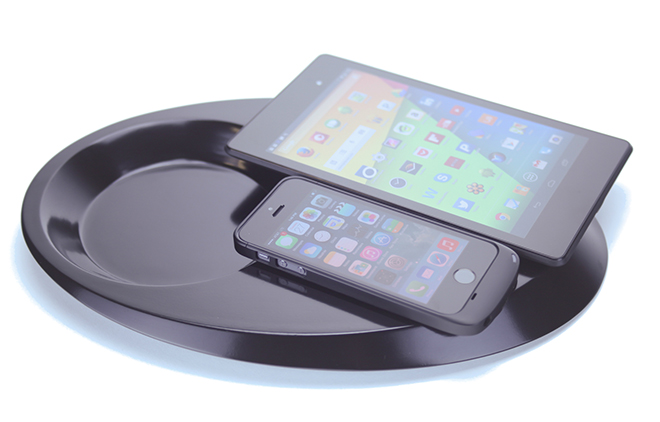 Announced by small tech firm Devant earlier this week, the Pond Wireless ecosystem of products looks to bring Qi wireless charging to Apple's iPhone 5 and iPhone 5s with a "Made for iPhone" charging case, tray and fob adapter. Already named a Kickstarter Staff Pick, the Pond project revolves around the Qi wireless charging standard, one of the more popular inductive charging solutions on the market. The star of the lineup is Pond's Stream, which is being billed as the "first globally available" Apple MFi-approved Qi wireless charging case to hit the market. Other case makers have created similar solutions, though apparently sales have been limited to specific markets. Stream is basically a Lightning connector-compatible Qi adapter shoehorned into a form-fitting iPhone 5 and 5s sheath. Like other two-piece case designs, Stream's bottom portion docks with the iPhone's Lightning connector, while a second part slides on top to lock the handset in place. As seen in the photo below, the "chin" section containing Qi charging circuitry is comparable in size to an extended battery case. According to Devant, the case delivers a maximum one amp of juice to the iPhone when sitting on a compatible Qi wireless charging pad. Regular models are crafted from ABS plastic, while premium versions use maple and walnut wood surrounded by ABS frames. The lineup's namesake valet tray comes in two battery powered versions, both of which include a carved out section for keys, coins and other pocketable items. The smaller Pond comes with an integrated 10,000 mAh battery, while the Pond Duo uses a 20,000 mAh unit and two Qi induction coils for charging two devices at once. Pond batteries are recharged via a common USB adapter. Like Stream, the Pond and Pond Duo also come in wooden versions for a unique premium look. Finally, the Pond Pebble is a small fob adapter that enables Qi wireless charging for nearly any Micro-USB or Lightning-equipped device. While not mentioned by Devant, electronics with higher capacity batteries like an iPad likely take longer to fully charge. Early-bird pledges for the Stream start at $45 ($70 for a premium wood version), while the Pond tray can be had for $125 ($140 for the larger Pond Duo). Pond Pebble adapters are only available in combination with a Pond tray purchase and packages start at $145. The Stream is expected to ship out to backers in August, while the Pond, Pond Duo and Pond Pebble are due in September. With 26 days left to go, the project has amassed $4,435 of its $30,000 goal.